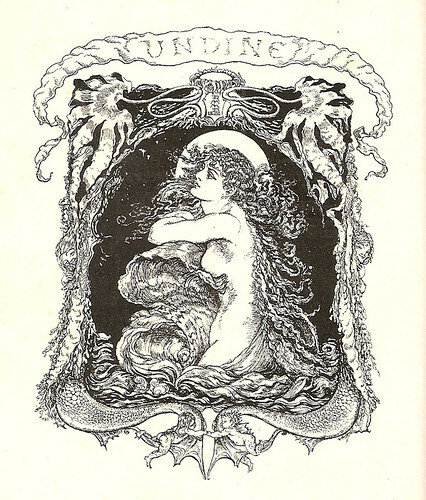 I found this Victorian Era copy of Undine by Friedrich de La Motte Fouque in the toss away bin on one of my recent book hunts. 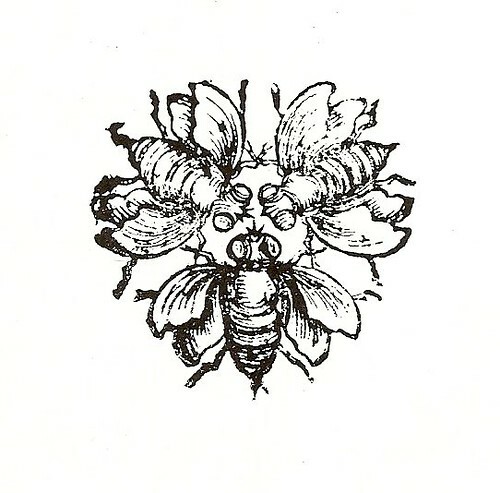 This copy, published in 1897, is illustrated by Rosie M. M. Pitman. 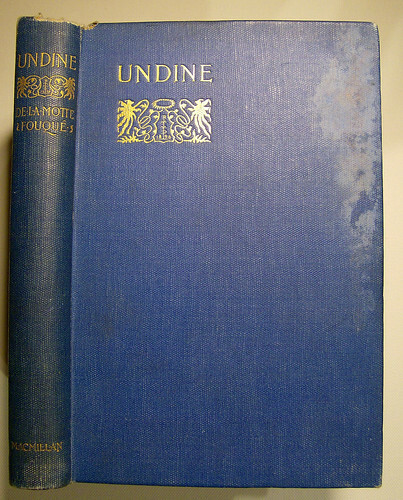 The cover and binding are water damaged but the pages and pictures are in pretty good shape. It appears to be unread since it still has uncut pages. One of my favorite stories about a water nymph who falls in love with a mortal and is gifted with a soul. It’s rather an epic fairy tale which someone aptly described as fairy tale noir. A lovely book with a well rounded and sympathetic heroine. Mischievous and somewhat unseelie water sprite steal a few scenes. There is a later version with Arthur Rackham illustrations. I’ve scanned a few of these less well known interpretations. 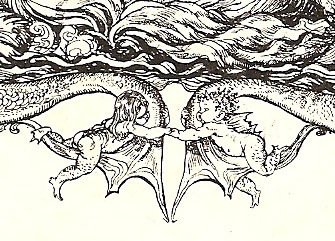 The detail on the Frontispiece (pictured above) depicts the water sprites who mock Undine for falling in love with a human. While sorting through the old books at the Horticultural Center, I picked up a musty old tome which I thought was a history of gardening. 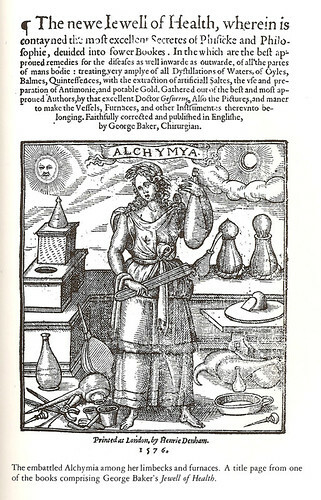 It turned out to be a book about alchemy and the construction of various types of stills. 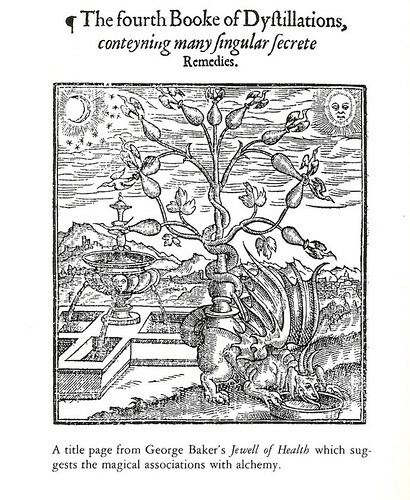 Most chapters focus on use of plants by the Puritans of New England for herbal medicines and tonics. However, it does occasionally veer off into herbal lore and “the chemical art” of the early alchemists. 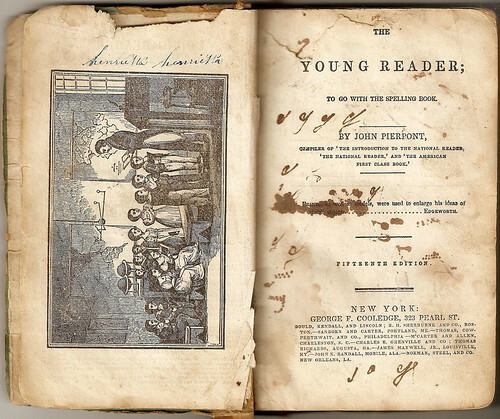 The book was in rough shape, water damaged and falling apart so the scans are not so nice. Of course, I had to offer up a few bits of it, since this blog threads together the subjects of my fascination – art, old books, gardening, and alchemy. Included among these tattered pages, is a hand drawn map from the 1600s of the area where I now live and work. Sadly, it was too faded and ink smeared to scan well. I typed it as it was. (Hopefully) Note: emblematical, eyeing and under tone ? Many persons seem to think that a goose is a bird that has neither wit nor wisdom. They laugh at the poor harmless animal and seem to consider it good for nothing but to be stripped of its feathers, for our beds, and to be roasted for our dinners. Now this is doing great wrong to this useful and valuable bird, which after all, has received from its Maker as much wisdom as it wants for its own use, and it sometimes has some left for the use of us owners. The city of Rome was once saved from destruction by the cackling of a goose, which wisely kept awake when the army of the Gauls was going to attack it, and when all the inhabitants had foolishly gone to sleep. And the story that I am now going to tell you, gives still stronger proof that a goose is sometimes a more sensible bird than he passes for. “I have known one,” says Mrs. Hall,–” a snowy gander,–who formed a singular and devoted attachment to a gentleman, and never deserted his side, if he could avoid it. “When the gentleman rode, the poor bird ran or flew after him. When he walked, it strolled along also; and refused food, even when pressed by hunger, except from his master’s hand. “At dinner time he used to sit patiently outside of the window that opened upon the lawn, eyeing his protector; and standing first on one leg, and then upon the other. 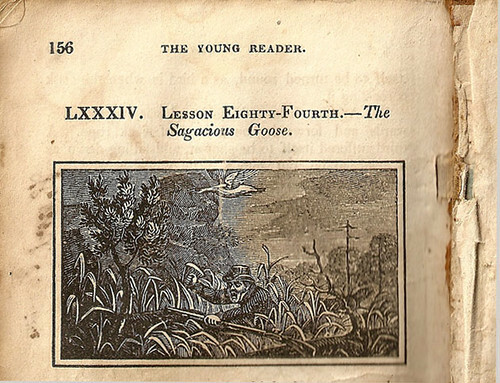 “But the greatest proof of superior intellect that he evinced, was one afternoon, when following his master through some marshy ground that skirted a neighboring bog; the gentleman, trusting to his knowledge of the dangerous district, did not take heed to his way as he ought and presently found himself sinking into a bog hole. “The efforts he made to get out, only sunk him deeper, and he must have been inevitably swamped, had he not crossed his fowling-piece over two fallen trees, one on each side of him, and held fast by that, although he had not strength enough to free himself from the thick mud, and the rank, tangled weeds. “His faithful dog seeing his master in this dilemma trotted off for assistance; and the gander, after walking around him, stretching his neck, and cackling in an under tone, at length raised himself into the air, and flew round and round over his head, making, at the same time, the loudest noise that he could. “This attracted some turf-cutters to the spot and the gentleman was extricated from the bog, before his servants, alarmed by Rover’s having come home without his master, had time to come to his assistance. I trust we shall hear no more from silly or mischievous boys, about the stupidity of a goose, until they will tell us how, if they had been in the situation of this gander, they would have contrived better than he did.